Tuesday: all day rush between hospital, collect back our daughter, etc. Big exciting day, but I was almost falling asleep while driving, avoiding an accident at the last minute. Also got a speed ticket for driving at 80kmh, while the limit at 70, but I was so numb that I traffic signs were optional at that stage. Tuesday 9pm: collapsed into bed. now it is time to enjoy the new-born !! Congratulations!!! That's quite some timing, be grateful that your wife did not go into labour while you were away. All the best to mother and son! I'm so happy to read this. Sincere and heartfelt congratulations to you and your family. Congratulations, after the emotion of giving birth to a healthy baby the disappointment of the marathon must disappear quickly. Sleepless nights and running back by 7 sounds tough! 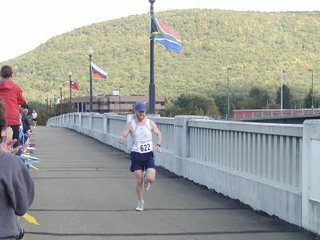 Congratulations on your newborn and recent marathon. This is more than a marathon to raise a newborn. You need to have a paternity leave if you can. Congratulations to you and your family! Done... With 12km of "via crucis"